Strong Kirchheimer fires a forehand. The senior is one of three Wildcats who will close his regular season home career this weekend. The toughest match of Northwestern’s season was saved for the last weekend. Friday, the No. 21 Wildcats (18-8, 6-3 Big Ten) will look to knock off Big Ten goliath No. 2 Ohio State (24-3, 9-0). NU will then play two matches Sunday against Penn State (15-11, 5-4) followed by Chicago State (7-14), when Senior Day festivities will take place for the Cats’ three seniors. Even with the special circumstances of the weekend, members of the team echoed the idea that they will prepare the same way for all three matches. The Buckeyes have beaten NU 14 straight times dating back to 2005, so a Cats win would be a major upset. Ohio State will come to Evanston having not lost more than a single point in any of its conference matches this season. If NU is to take four of the seven points necessary to win, Swan said it will have to start with the doubles point, an area that has been shaky recently. The three matches are the final ones of the Cats’ regular season, offering one last opportunity to improve their seeding for the Big Ten Tournament and, afterward, the NCAA Tournament. NU is currently tied for fourth in the Big Ten standings, and its match against the sixth-place Nittany Lions could serve as a tiebreaker for tournament seeding. In the bigger picture, if the Cats are able to secure enough big wins over the next two weekends, they have a chance to push their national ranking from 21 to the top-16, a mark that would allow them to host the first two rounds of the NCAA Tournament and secure less daunting matchups. This weekend could be the last matches that NU’s three star seniors will play at home. The trio of Strong Kirchheimer, Konrad Zieba and Sam Shropshire are four-year starters and played in the top three singles spots in different combinations for the last three years. 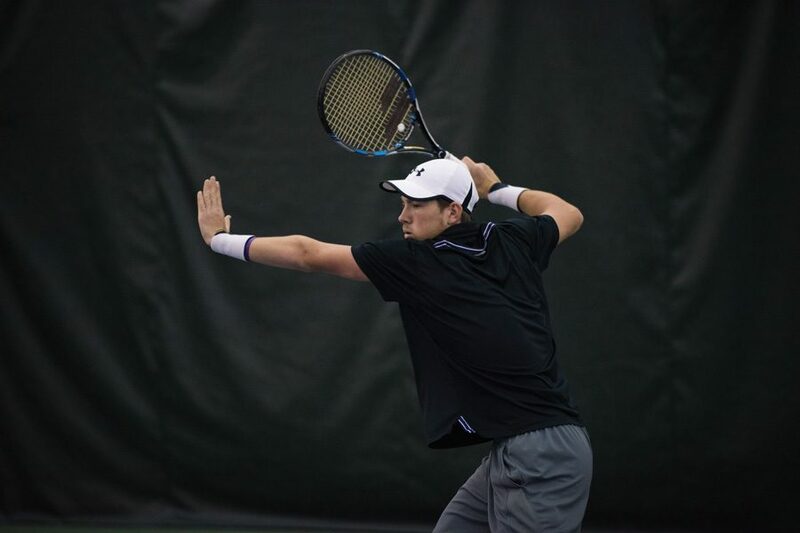 “They’ve done a lot for this team, obviously they’re all three great tennis players, so I think it’ll be fun to go out there and play with them on Senior Day,” sophomore Ben Vandixhorn said. However, Kirchheimer deemphasized the ceremonial importance of the weekend and instead said he is focused on the team having a successful weekend and getting a win over one of the nation’s best after numerous close defeats.